For those of you who may have been interested in the outcome to my question on the DX88 back in 1998. The background was that my fist Vertical was a butternut two bander which I purchased second hand from a member back in 89, and which was added too, to make it five bands. It was the first aerial on the then GB7EMX AMTOR BBS. This was then replaced after two years by the current HF6V-X Butternut purchased new. Electrically it was fine, but the small and large capacitors failed mechanically on a regular basis after two years and also took on quite a lean due to ware on the insulators at the base and between coils. The present one was vandalised some three years before, and then again about a month ago. Though repaired, I did have police involvement and did put in an insurance claim on the house insurance. This was paid within 72 hrs by return cheque in favour of the Matlock Emporium. So do I get another Butternut (HF6V-X �9.95) or move up a grade, still only having a small garden and asking around the HY-Gain DX88 (�9.00), seemed to get the best replies, re operation and mechanical stability. Unfortunately the 40 to 10 Cushcraft R700, with the R80 add on kit (total price �9.90) falls over in high winds unless well guided, allegedly! So the difference between the insurance and the actual cost was made up and one ordered. As per normal Amateurs Murphy's law there was none in stock. So I awaited the next batch from the USA. On Tuesday this week 20/10/98, it arrived. And as normally to look at all the bits one wondered if I had made the right move. Still you pays your money and you get on with it. The instruction book was very good compared to other instructions for other vertical's I had put together, Plus a lot of it was stainless steel and or light alloy. I was able to assemble all the sections in the kitchen. The down side was that it comes with no ground mount pole (as supplied with the Butternut).So a visit to the local Blacksmiths produced a three and half foot 50 mm OD post on a six inch sq base plate to help vertical alignment. And I had four fins put on at the ground level ref point (eighteen inches from one end), to help with the cement anchor. So two foot in the ground and eighteen inches above ground. Cost � and made in twenty four hours. Other item not supplied (but comes if you buy the radial kit) is the DC Shorting coil. It tells one how to make one up though. But as luck would have it I had the one in a box from the first Butternut, so was able to use that. So hole dug, two bags of B&Q instant cement, and the post was mounted in two hours. Then I took down the old Butternut, pulled up all the radials (which in fact are quarter wave wires for each band). Re located and buried radials, managed to find a back to back PL239 plug so I was able to fit the lighting arrester directly at the feed point to the aerial base.Put a five foot brass W&S earth spike in next to ground post, for a safety earth to ground of aerial and lighting arrestor. Assembled and greased up the joints with copper Anti Oxide gunge, plus silicon grease on the three Clamps used on the top sections. 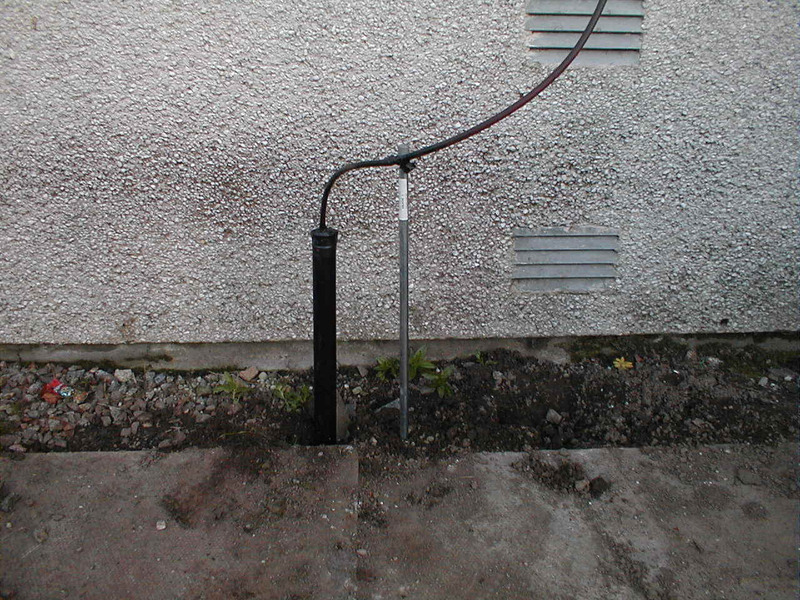 Bottom of aerial with Coax going under ground. Only bit that one has to think through is the final assembly overall view page 3 -16. As you need a sky hook to be looking down from the top to see how the traps and there capacitors line up in relation ship to each other for each band, when erected in the vertical, as they are offset from each other. So apart from the last bit I found it a doddle to put together compared to MFI & Hygiene furniture hi hi. Powered up and all bands, SWR is better then 1.5 to 1. 80 @ 3.740 is 1.5 to 1 and I can use the ATU there. All other bands I can use the trough position on the ATU. This was first time on each band, I can remember when I set up my first and second Butternut it seemed to take for ever going to and from the shack/aerial adjusting to get the SWR right. One could not use an ATU with the AMTOR BBS as one had to be able to scan and lock onto any one of twenty four QRG's across six bands. Coax coming out of ground at house end. So I await to see what we can work. I had, had advice that it was hard to load on 80, not so. I think some may miss understand the instructions for the SUM length of the capacitors for 40/80 mtrs, page 3.13 Graph 2. Power rating is 1500 watts pep - 700 watts pep average, compared to 500 watts pep on the Butternut. So shall be able to go QRO on SSB with no Problem !!!!! So it looks the part and it is truly vertical, whilst I have enjoyed using the Butternut it became hard work on maintenance. So we shall see what the DX88 is like in five years time. Back of GM4EMX QTHR showing the DX88. Again Tks to all who offered advice on going for the DX 88. Telex the owners of Hy-Gain have sold all Amateur Business to MFJ. When similar products to Hy-Gain will appear again I do not know. Have spoken with MFJ more then once, it could be 2001 before product is back on the market. 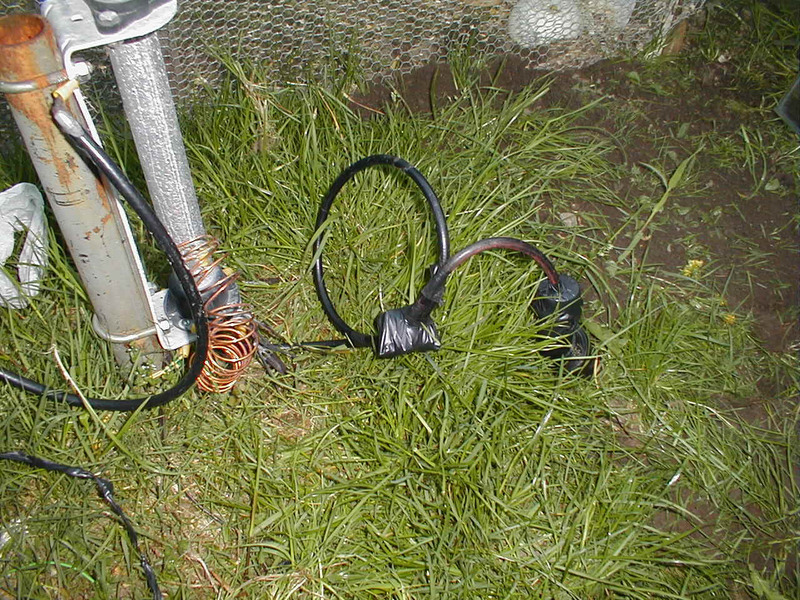 The DX88 in 2004 started to get an intermittent fault, this was due to the base getting fractured due to the high winter winds and not having the aerial guyed. Due to the above I was unable to buy a spare part bottom section replacement. So the Arial was taken down and a Hustler 5-BTV was purchased. Not a very good instruction book and rather narrow band allocation. At the same time I also purchased from the USA DX Engineering Tilt Base Mounting plate. This has been a boon to lowering and raising the vertical. In early 2009 having, returned to HF. I made contact with the new Hy Gain <MFJ> via there web pages and ordered a replacement bottom section for the DX-88. This dually arrived via UPS (Fright and UK tax was more then the original cost). I had tried to purchase a part via Walters and Stanton. But to be honest after a month of trying they could not provide a quote. So the old parts of the DX (Which had been lying in the garden for two years), where taken too pieces. Some new securing nuts and bolts purchased from B&Q. And the Arial 100% cleaned and rebuilt. In February the DX-88 was back in action on all eight bands. Plus this time I also installed some low level guys this time round. I now intend to source the 160 Mtr add on base coil section in due course, this was the original plane back in 2001.